The item Adventure time, Issue 40, (ebook) represents a specific, individual, material embodiment of a distinct intellectual or artistic creation found in Charlotte Mecklenburg Library. It's a special interactive, one-shot issue! 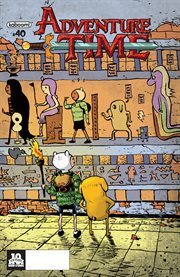 Magic Man plans to use the reader to help beat Finn and Jake, but can our heroes turn the tables?